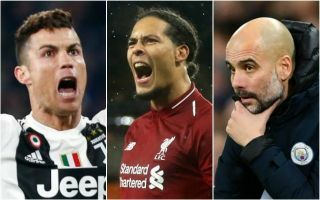 As it’s the international break and we’re all missing club football, we’ve got a big dose of predictions to keep you going until next weekend as CaughtOffside writers try to work out who will be taking home the big prizes in the final months of the season. It’s now almost certainly a two-horse race for the title, while third and fourth remain very much up for grabs between four teams. Elsewhere, the Champions League and FA Cup are really hotting up, while even the Europa League is getting to that stage where it’s just about watchable. Mark Brus – I think I’m the only one going for Liverpool! They’ve still only lost one game and have the best defensive record, which is usually a decent indicator of the team most likely to go all the way. It will be close, but I think their blip is behind them now and they can enjoy the easier run of fixtures to *just* pip City to the post. Sam Wilkins – Despite being two points behind Liverpool and having games against Man United and Spurs to play, Man City should still have the quality and squad depth to pip Jurgen Klopp’s side to their fourth Premier League title this season, especially seeing as they have the likes of Kevin De Bruyne and Fernandinho still to come back from injury. Ron Carne – Man City. Experience will be key, Pep Guardiola’s men have been here and done it and have the quality to continue to compete on multiple fronts. Jaikuran Randhawa – Pep Guardiola’s side simply have too strong a squad to come second best to Liverpool. The only way I can see Liverpool beating them to the league is if Manchester United beat City when the sides meet at the end of next month. James Westwood – Manchester City will win the title by at least six points, as Liverpool struggle to balance domestic duties with the Champions League. Pep Guardiola’s men have hit their stride at just the right time, while the Reds still look one or two players short of being the finished article. Mark Brus – It’s extremely close, but I’m leaning towards Manchester United and Tottenham to get those final Champions League places. Chelsea are a mess and will surely stay where they are in 6th, and Arsenal have a shocking record away from home that will surely be their undoing. Man Utd had a setback at the Emirates Stadium but are very much the real deal under Ole Gunnar Solskjaer, while Spurs have been here before under Mauricio Pochettino and know how to see a top four challenge through. Sam Wilkins – Given the fact that both sides will most likely only be in one competition come the end of the quarter finals of the Champions League, United and Spurs should have enough in them to secure top four finishes ahead of Chelsea and Arsenal and qualify for next season’s Champions League, especially seeing as both the Blues and the Gunners are still in the latter stages of the Europa League. Ron Carne – Arsenal and Man Utd. Gunners look in good form and have a favourable run-in, while United can’t be written off despite their recent stumble having been resurgent under Solskjaer. Spurs have a tough fixture list and it remains to be seen how they settle in their new stadium. Jaikuran Randhawa – I think United and Arsenal will win the race for a top four finish. Arsenal have a much easier run in than their rivals and their recent win over United will give them the momentum they need for the battle ahead. Tottenham have been in extremely poor form recently and they still have Liverpool and City to play in the league. Spurs’ poor form leaves the door wide open for United to come in and steal a spot in the top four. They have a fairly tough run in, as they’re playing a lot of the teams in the top ten but with Ole at the wheel I can see the Red Devils snatching a top four spot in Fergie time. James Westwood – I’m backing Ole Gunnar Solskjaer’s United to embark on another winning run between now and May, which will ultimately secure 3rd spot in the Premier League. Tottenham seem to be in decline at the worst possible time, which is why I think a rejuvenated Arsenal will ultimately end up stealing the final place in the top four. Mark Brus – All logic points towards Virgil van Dijk. He’s been absolutely outstanding for Liverpool and there’s arguably no more important a player to their side this season, though if Sadio Mane carries on like he has recently and gives the Reds that little bit extra in swinging the title towards Anfield, I imagine he could be a surprise late contender too. Sam Wilkins – Raheem Sterling. Given his fantastic form for Man City so far this year (15 goals and 11 assists), combined with the fact that Pep Guardiola’s side could very well win yet another Premier League title this term, Sterling should be everyone’s favourite to take home the POTY award. Seeing him win the award would also prove all his critics wrong, something that’d make him winning the award just that little bit sweeter. Ron Carne – Raheem Sterling. Much will depend on who wins the title as that should influence who wins, but Sterling arguably doesn’t get the credit he deserves. 15 goals and 11 assists in 27 league games, he’s been decisive. Virgil van Dijk for PFA Player of the Year? Jaikuran Randhawa – I believe that the Player of the Year winner should be VVD or Sterling – but the winner should be from the team that wins the title. Van Dijk has been superb for Liverpool this season, his commanding presence and ability to read the game have left attackers with little chance of getting the better of him. Sterling has been equally sensational, with the England international now arguably the focal point of City’s attack. James Westwood – For me, the only choice is Manchester City’s Raheem Sterling. The English winger has stood out in a side full of world-class players this term, emerging as City’s most consistent performer. Mark Brus – A boring answer, but it’s surely going to be Harry Kane, isn’t it? Injury is the only reason the Tottenham striker isn’t already in the lead, but he’s got enough time now to bang enough in and scoop up the award again. Sam Wilkins – With Man City still having to play the likes of Cardiff, Burnley, Fulham and Brighton, Argentine sensation Aguero will have enough time to break away from the chasing pack in the Golden Boot race and claim the award for just the second time since his arrival back in 2011. Ron Carne – Sergio Aguero. Difficult to see the Argentine not continuing to score goals between now and the end of the season, including many crucial ones no doubt. Jaikuran Randhawa – Aguero has been phenomenal since the turn of the new year and considering that the City star has the ability to score all types of goals – and the fact that he takes penalties, puts him ahead of his rivals for the Golden Boot. James Westwood – Harry Kane usually finishes the season very strongly and I wouldn’t be surprised if he manages to scoop this award again with a late flurry of goals. Mark Brus – Juventus, for two simple reasons. Firstly, they have Cristiano Ronaldo. Secondly, they are absolutely strolling to the title in Serie A so can focus all their energy on this competition in a way that none of the other leading contenders can. Ron Carne – Juventus. This could be the year. Cristiano Ronaldo is warming to the task now after his hat-trick against Atletico Madrid, and I can see them beating Ajax and getting the better of Man City in the semi-finals after their thrilling yet taxing tie with Spurs. Cristiano Ronaldo to win another Champions League with Juventus? Jaikuran Randhawa – The X Factor that Ronaldo brings could finally see Juventus get that Champions League trophy that they’ve been longing for. The Portuguese goal machine lives for the big games and has proved countless times that he should never be written off and I think this is what separates the ‘Old Lady’ from their rivals. James Westwood – I backed Juventus from the beginning and I am going to have to stand by my original prediction. The Champions League is Ronaldo’s stage and he has given Juve that crucial clinical edge in the final third that they lacked in previous seasons. Mark Brus – It would be nice to believe Wolves can do it, but Manchester City have it in them to steamroller all the teams left in the competition. They’ve surely got this one in the bag. Sam Wilkins – Manchester City. They have to beat two of Brighton, Wolves and Watford to win it. Does anymore really need to be said? Ron Carne – Man City. The treble is on for Guardiola and his men, they’ll see off Brighton and beat Wolves to it in the final. Jaikuran Randhawa – City are levels above the remaining opposition in the FA Cup, with all respect to Glen Murray and Co. – Brighton stand little to no chance of going through. Should Wolves beat Watford, the final could be interesting given Wolves’ impressive record against the top six, but City have it all the flair, finishing and ability to carve open defences like they’re a tin of soup. James Westwood – I fancy Wolves to reach the final against Manchester City in May and spring the mother of all upsets, purely given their record against the top six this season. Nuno Santo’s side have shown they seem to come to life against the big six this season, and with Jimenez and Jota upfront they are always dangerous on the break. Mark Brus – I’m going rogue and saying Benfica are decent dark-horses for this competition. They’ve got a superb young team with top talents like Joao Felix and Ruben Dias who will no doubt be poached by big clubs soon. Like that Monaco side of 2016/17, I think they’ve got one big season in them. Can Maurizio Sarri salvage Chelsea’s season with a Europa League win? Ron Carne – Napoli. With the Serie A title out of reach again, back Carlo Ancelotti’s experience and pedigree in Europe to deliver Napoli’s first major trophy in years. They’ll get the better of Arsenal over two legs, see off either Villarreal or Valencia and perhaps even set up a reunion with Maurizio Sarri in the final. Jaikuran Randhawa – This will be a close call but given the fact that Chelsea’s main rivals – Arsenal and Napoli will be facing each other, the Blues’ chance of winning the cup have massively increased. Chelsea will essentially be fresh when it comes to the semi-final and final of the competition, at this stage of the season I think this will be a massive factor. James Westwood – If Arsenal can get past Napoli their name is on the trophy in my opinion and I’m betting they, with the help of Europa League-winning specialist Unai Emery, will reach the promised land with a final victory against Chelsea in May.